I keep a personal journal. These days, much of my life is open and in plain view. I did it to myself, but sometimes, it’s nice to have a few thoughts that are just my own–guarded from the world and others’ opinions and commentary. Last night, the first sentence I wrote in my journal was, “A blessing and curse in my life is the ease in which I get things.” Writing it, I knew it sounded smug. Those closest to me, though, know what is meant by those words. Growing up, there wasn’t much that I had to fight terribly for. Algebra made sense. I got along with my parents, even as I went through puberty and should’ve been rebelling. I won awards and elections. I had good friends. I got into college. It was smooth sailing. A blessing. And for what’s it worth, I always realized that and gave thanks to God for these things. I knew that all of it was because of Him. Yet, the older I get, the more I realize that the ease in which things fell into my younger life was a curse. I never really understood the value of having to work hard for something. In my younger days, I never had to fight tooth and nail to get something or to keep something. If something or someone put up a battle, my response was simple: Walk away. My rationale in doing so was simple: Something else will replace it. Then my mid-20s hit. I was miserable in my job. My relationships were suffering. I didn’t have a real home to call my own. I didn’t know myself and couldn’t find my purpose. It seemed like everything I had was lost. Gone. Despair set in. I prayed a lot during that time of my life. I remember feeling so raw and so open for a chance to come my way. I prayed that God would show me my purpose and put me on the right path. I prayed that He’d open up the doors that were meant for me and that He only lead me down the roads I was meant to travel. I had the greatest hope in my heart, that even though I felt miserable and desperate, He’d give me an answer. And He did. He showed me my purpose. Over time, He revealed to me that the reason I am here on this Earth–my purpose–is to be a storyteller. He pulled back layers in my memory that exposed experiences in my life that revealed this purpose more clearly. Like the tendency of complete strangers to often approach me and lay their life stories on me. Or my ability to remember in extreme detail one particular day’s events. Suddenly, everything was clear. It made sense. I had a purpose. The first way I began truly fulfilling my purpose on this Earth was launching RulingSports.com. I’ve written here a lot about the importance July 1, 2011 played in my life. It opened up doors to other opportunities, like the ones I have with Forbes and The Huffington Post. In turn, those opportunities have led me to other amazing people who have given me the great gift of telling their stories. It’s been amazing. A whirlwind. A blessing. Truth be told, though, in recent months I’ve been feeling a bit uninspired. I find that I’m writing stories merely to fulfill contractual obligations. I am so in love with my job at the University of Miami, that sometimes I ask myself why I am spinning my wheels continuing down this path of writing. There’s been moments that I’ve considered hanging up the proverbial writing towel. Today on the Huffington Post I published one of the stories I am the most proud of. 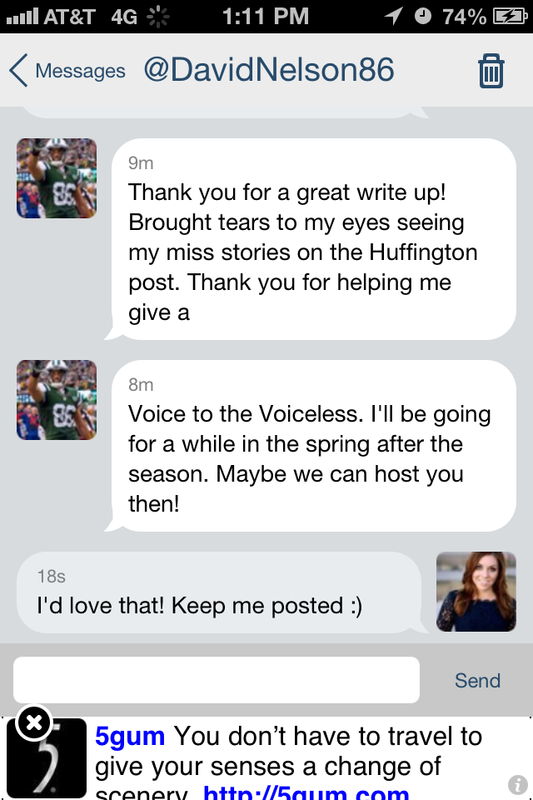 A couple weeks ago, I received an email invitation to the launch party for New York Jets wide receiver, David Nelson’s foundation. Truth be told, at the time I had no idea who David Nelson was. However, the body of the email struck a chord in me. I learned that Nelson and his brothers, after traveling to Haiti and seeing the conditions of orphans there, decided to go back permanently and take care of orphans. I was moved by this, because what I saw was people taking action upon seeing a problem. I responded to the email telling the event organizer that I was grateful for the invitation, but was unable to attend. I then mentioned that I’d be happy to write a story about the organization. Several days later, I interviewed David about the foundation. When I conduct phone interviews, I type furiously as the person on the other end of the line talks. I then close the Word document and only come back to it when I’m getting ready to write the story. When I did so last night and I looked at his words, I was so, so moved by the purpose he is fulfilling in his own life. It was a gentle reminder that there is so much good in this world. I needed David’s story. In the sports world, it is so easy to get jaded. The mainstream media so often force feeds us stories about missteps of professional athletes. What the mainstream media forgets to remind all of us in those stories, is just like us, professional athletes are human. We all make mistakes. Yet, when you are working and living in this world, it’s easy to get jaded. So, I needed this story. I needed a reminder that in fact, the bulk of people I surround myself with are good, honest people living out their live’s purpose. A voice to the voiceless. Me? I could be that? Reading those words shook me to my core. They instilled in me again the reason why I do this. They reminded me why I spin my wheels writing these stories, why I give up time with family, friends and loved ones to chase the story. My day could’ve ended pretty amazingly right then and there. I think, though, that God knew I needed a few more reminders that writing is truly my life’s purpose. Two days before I left for Greece, I drove to Orlando–and back the same day–to interview the owner of A.S. Roma, James Pallotta. Given how busy I was around this time and the fact that I was getting ready to leave the country for two weeks, in all honesty, I was dreading the trip. Meeting Pallotta, though, changed my feelings. In him, I met one of the wisest and sharpest business people I’ve come across since writing for Forbes. And for what it’s worth, I’ve met a lot of business people since writing for Forbes–some wise and others, well, not so wise. If I were to be perfectly honest, I was pretty certain that Pallotta hated me during the course of our interview. The next day, I told my dad that it was one of the most difficult interviews I ever conducted. He seemed rushed, uninterested and relatively unamused with me. The interview was conducted in a makeshift media room that was housed in a trailer. Throughout our interview, countless people walked in and out and some even interrupted our conversation. However, throughout it all, I stayed focused on one thing: Getting the story. I didn’t flinch when he posed hard questions back at me. I didn’t look away from him when other people walked into the room. I asked my questions, knew when I had what I needed and wrapped the whole thing up relatively quickly. 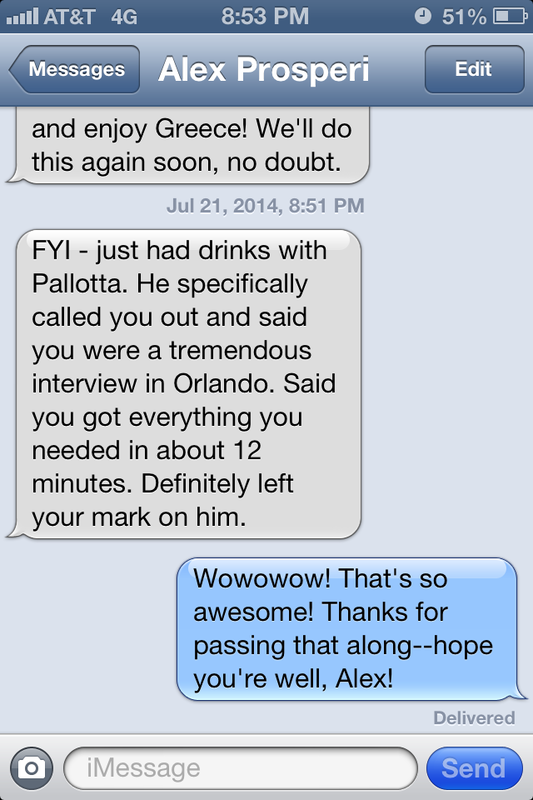 Today I got this text message from Pallotta’s publicist. It blew me away. So, there’s that. And that’s really awesome. Over the last month, I’ve felt like I lost my spark. My passion for writing felt zapped. Today, it was reignited. And when I think back to the last six months of my life, the messages being sent to me to follow this purpose of my life become so clear. Whenever I get on an airplane, the first thing I do is fall asleep. However, on a flight from Dallas to California this spring when I saw the cute older couple next to me, I for some reason was inclined to stay awake. This is the first flight in a long time that I can remember staying awake. And I’m glad I did. The gentleman sat next to me and throughout the whole ride, he talked to me about the years he spent writing a book. I could tell how important it was to him and how great of an experience it was for him. During that conversation, there was something pinching at me telling me that I should consider writing a book. It pinched at me, but it didn’t sway me fully. It didn’t seem like something that was truly feasible or realistic or in all honesty, anything that I had real time for. Since then, I’ve been approached by two publishers to write my own books and another to write a book chapter. One publisher wanted me to write a sports law textbook. Another wanted me to write a sports law book that would be more mainstream. The book chapter would be for a sports law textbook. I was blown away by these opportunities. Seriously. What an honor! What I say next may rattle you. It may sound ridiculous. It might sound greedy. Hear me out, though. I turned down both books. I was so grateful for the opportunity presented by each publisher, but as I prayed about them, I kept realizing that I need to spend my time focusing upon stories outside of sports law. Sports law has given me such a great platform. However, it is not my life. It is not all there is to me. There is a bigger, bolder voice inside of me. Spending time writing those books would hold back that voice. Doing so would stifle my purpose. This is a risk. I may never be accepted by another publisher again. And I know that. This isn’t the safe route. This is a route that will require fighting and things not just happening with ease for me. However, it’s the path that I feel is right. So I’m traveling it. And I hope when my story is done, that you’ll read it.